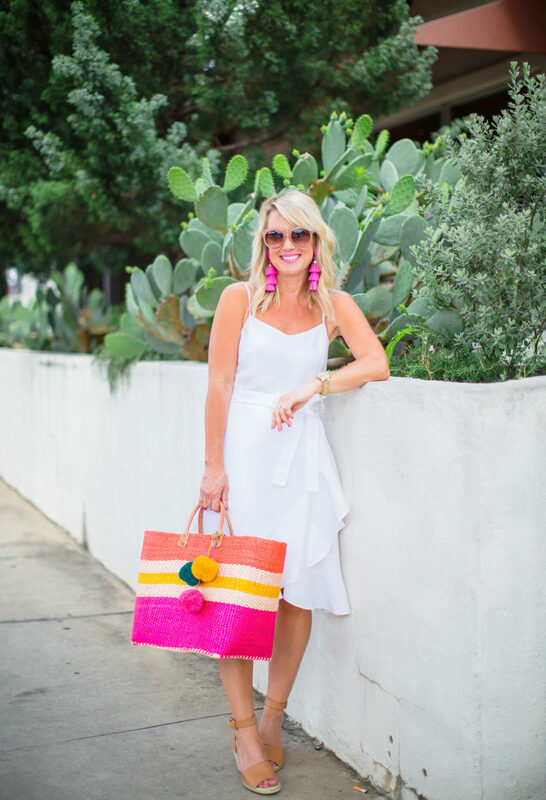 Summer Whites + Brights | hi Sugarplum! I’m no stranger to color, and especially not bright colors. Sometimes I let one color take centerstage, but when I’m feeling particularly cheerful, I’ll pair two brights for one seriously happy combo! 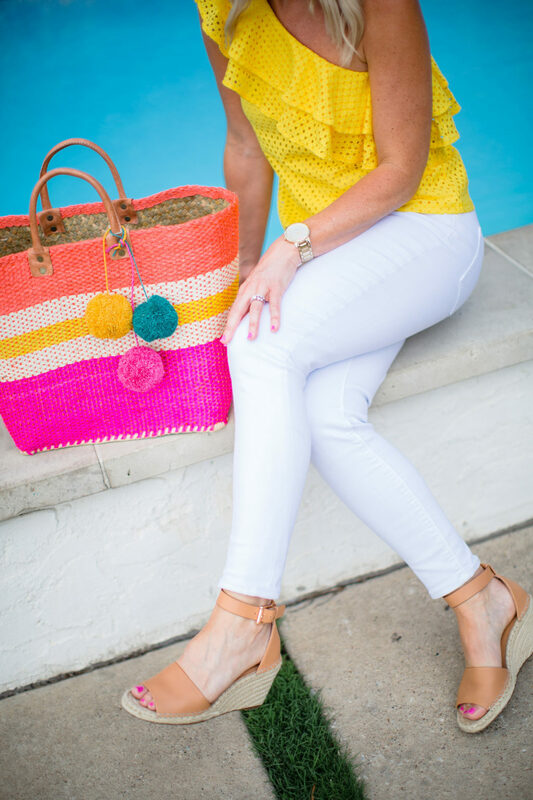 To keep from looking like a walking bag of Skittles, I usually balance the brights with calming whites. 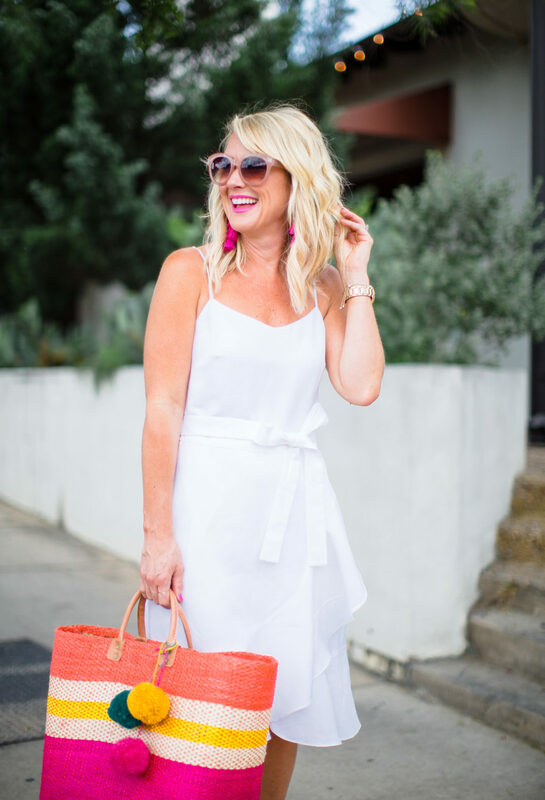 Today’s Summer styles are the perfect examples. Since I added even more color with the bag, I kept my shoes neutral…usually it’s one or the other. And even though my earrings are bright, the eye sees the color as one with the top, so it’s not overwhelming. And let’s talk about this top for a moment!! 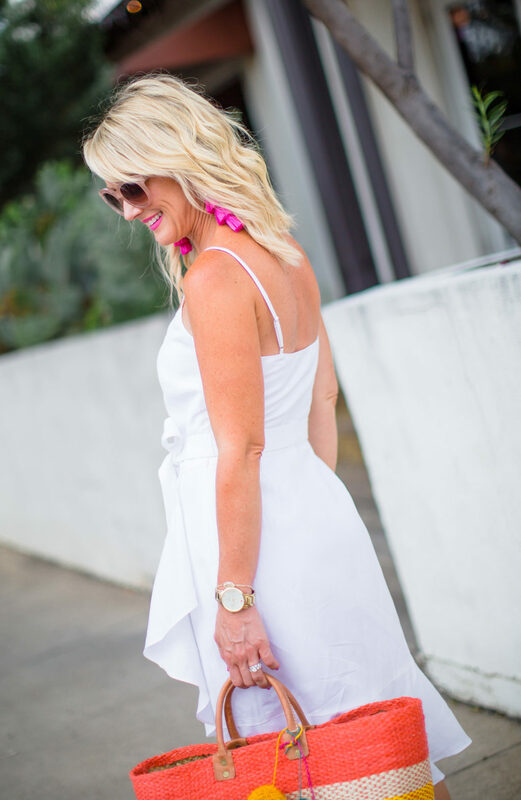 One-shoulder tops are my favorite of all the ‘shoulder’ tops (aka, off-the-shoulder, cold shoulder, and strapless). They have the same flirty vibe, while staying firmly in place and allowing for full range of arm motion. And you can easily add a jean jacket if you need to cover that sassy shoulder. I’ll wear this one with jeans, shorts, and even tucked into skirts. 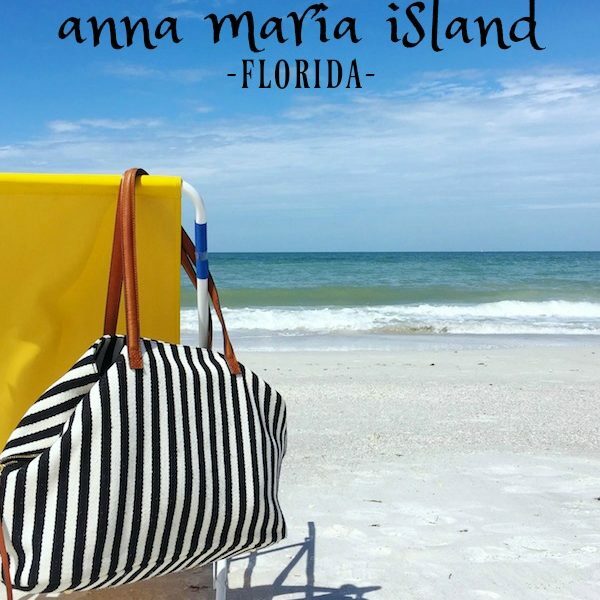 And the material means it packs like a dream…perfect for Summer weekend getaways! 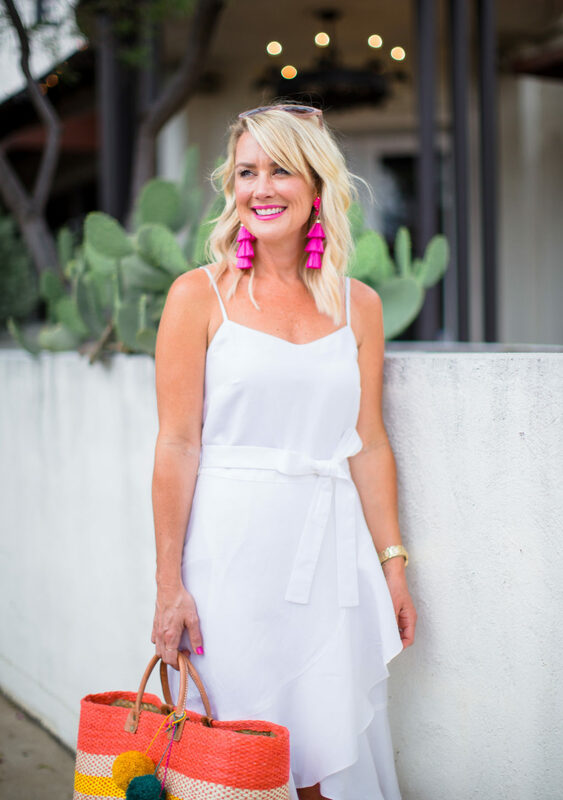 Thanks to Banana Republic’s Endless Summer Event going on now, it’s 40% off!! 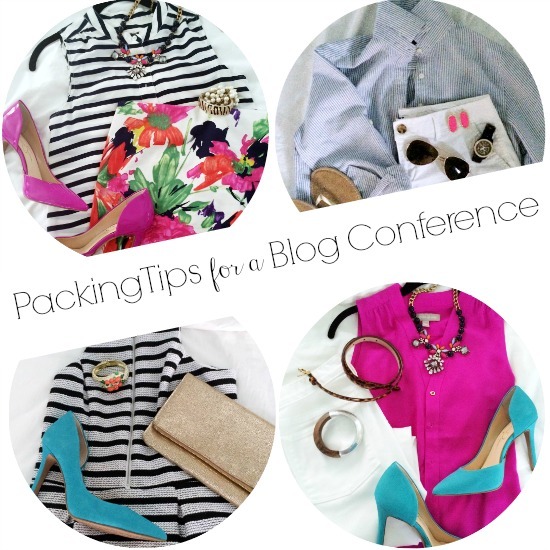 Fit Tip: The top is a cotton/nylon blend and fully-lined. It falls to the hip, and is cut straight through the torso. I’m wearing a regular 0, but petite and tall sizes are available. 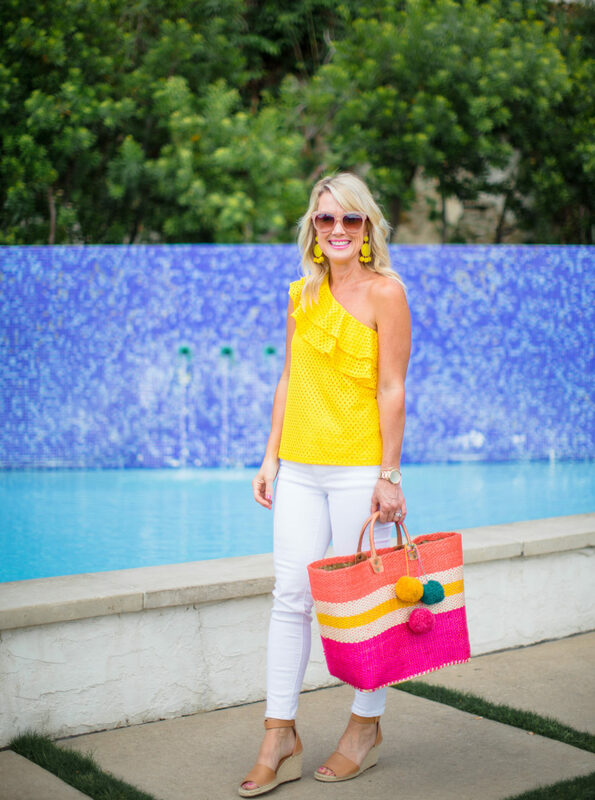 For a second colorful style, I added bright earrings and bag to an otherwise neutral combo. 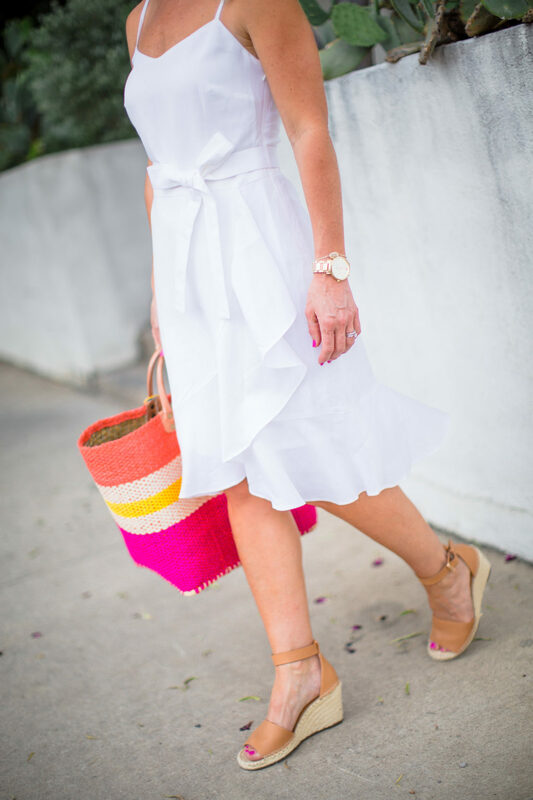 White dresses are the perfect blank canvas for a variety of combinations, from soft and neutral to bright and colorful. 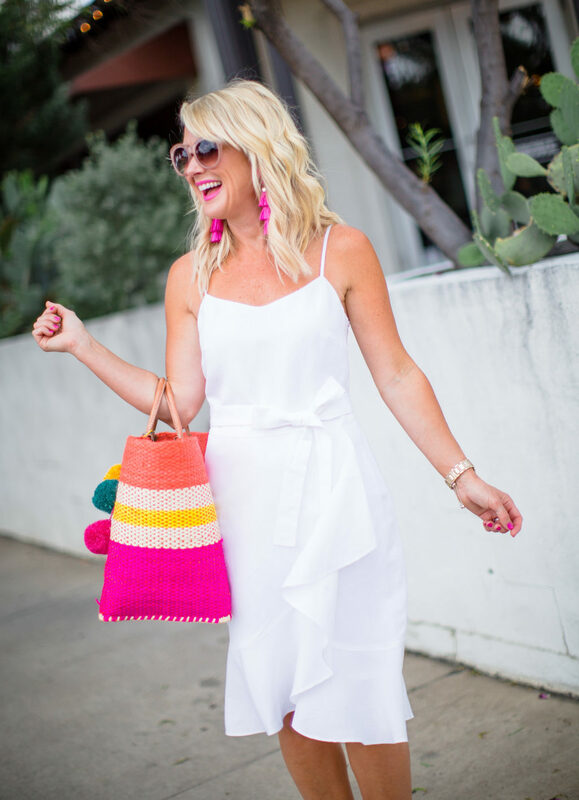 And considering I’ve worn this white dress twice in one week, it’s safe to say it’s a Summer favorite already! The material is a soft linen-blend, but doesn’t wrinkle like a pure linen. 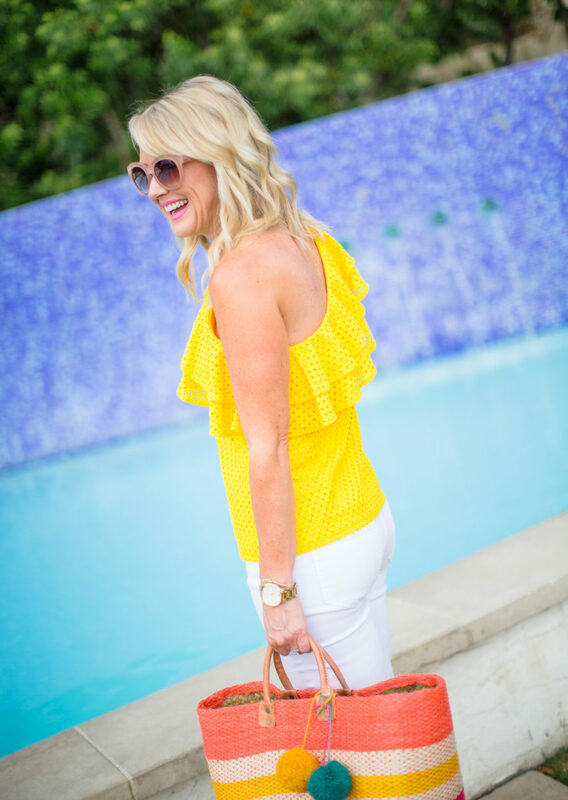 It’s fully-lined with adjustable straps, and a flirty ruffle hem. 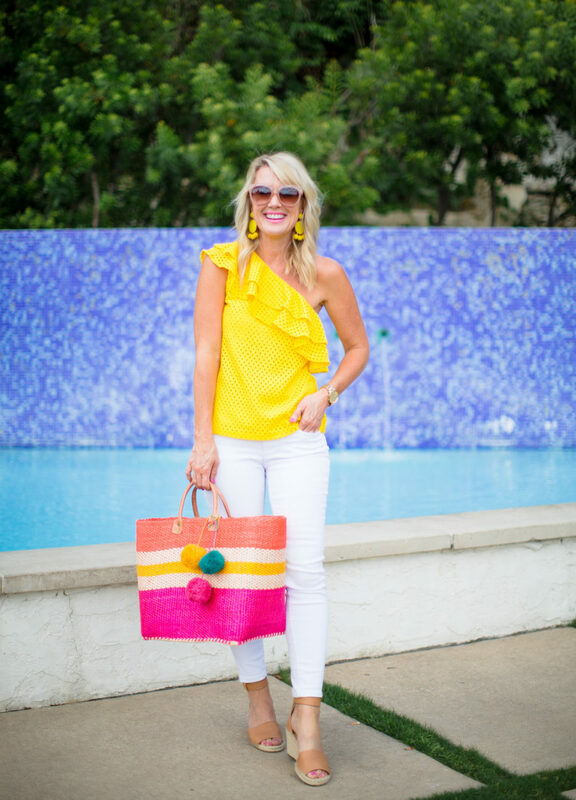 I’ll wear it for everything from baby showers to beach vacations! Fit Tip: I’m wearing a regular 0 and it falls to my knee. Petite and tall sizing is available, too. It’s darling with a jean jacket and flat sandals, and of course pairs with every color under the sun! 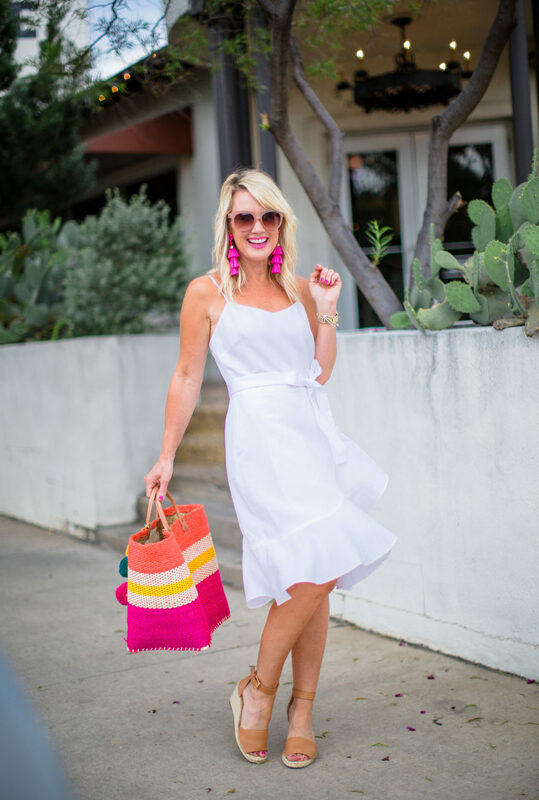 So tell me, are you a Summer Whites or Summer Brights kind of girl? Or a little of both maybe? I know these pieces will be coming with me on all our long weekends this Summer! See you back here tomorrow for another You Ask, I Answer post! 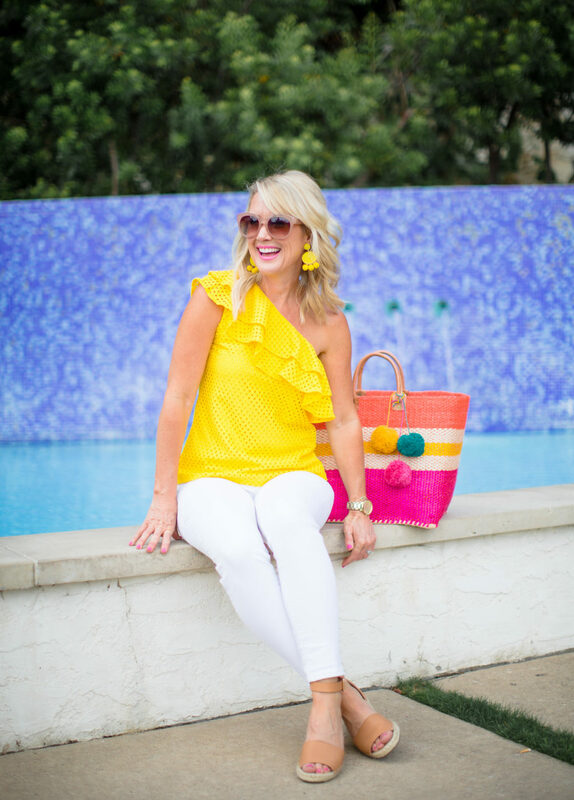 That sunshine yellow top is DARLING! 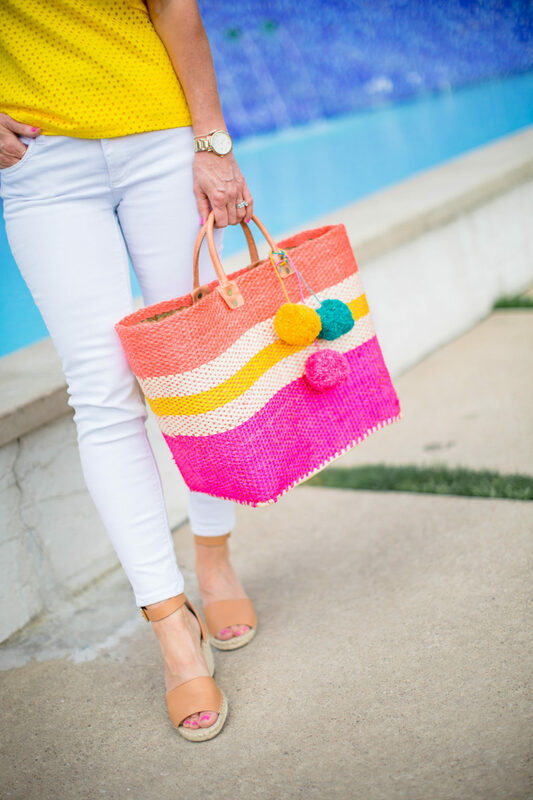 Give me all the summer brights! 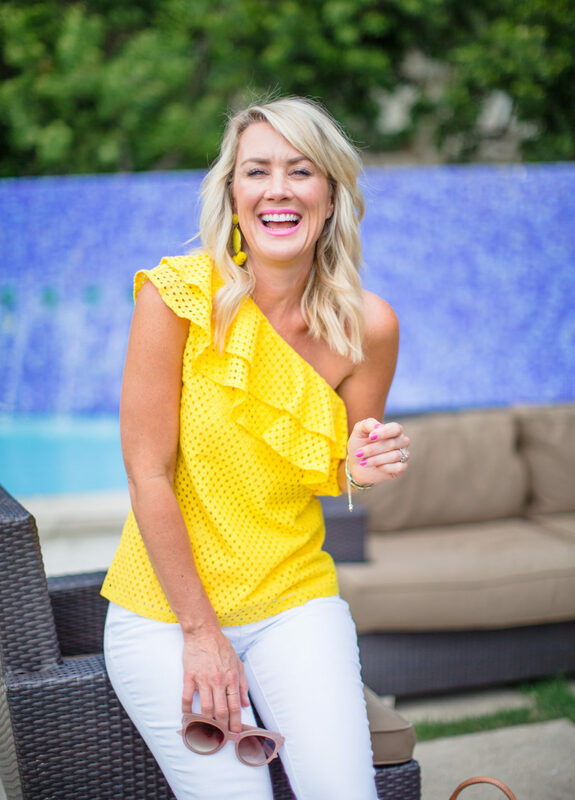 What really makes this top a standout is it’s “lacy-ness” factor. Super cool, and cute. Thanks for the tutorial. Luv it! 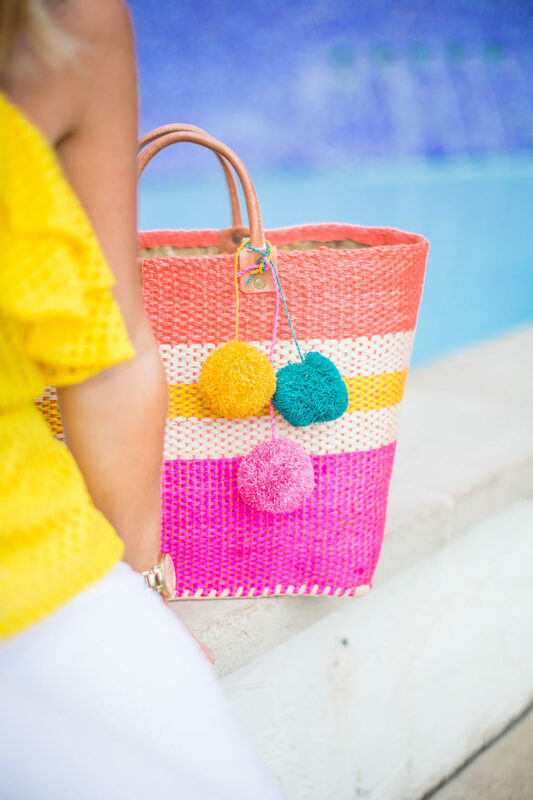 That is such a cute bag! I love the white dress too! 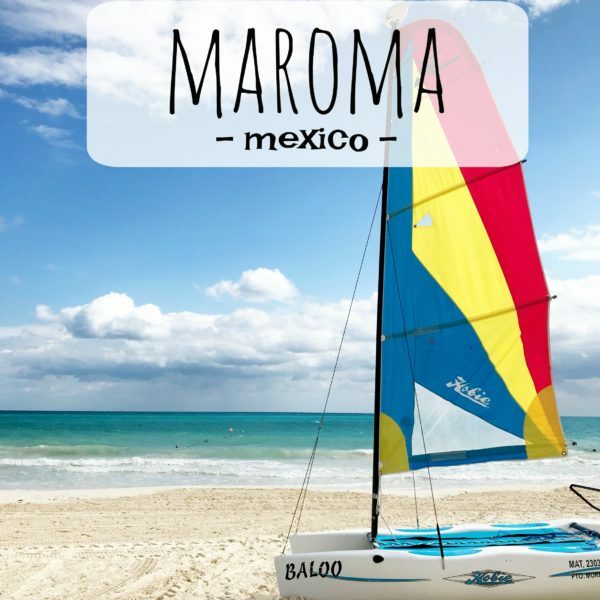 I found your blog thru Honey We’re Home…and I love it!! I am a 41 yr old mom of three school age boys and need age appropriate casual outfits and love your style! I can’t wait for the 29th and would love a swim try on sesh!